The WordPress.com stats helper monkeys prepared a 2013 annual report for this blog, as they do each year. Click here to see the complete report. My total views were up less than 3% from last year—I’ve probably reached a steady state with people giving up on reading my blog at about the same rate that new readers come in. My number of readers may have gone up a bit more more than 3%, as I think that I’ve not been posting as much in 2013: only 289 new posts (but today’s posts were not included, so it is probably 291). None of those are particularly good posts, but they have good links to other information sources, so come up high in search engine algorithms. Some of my most popular posts from this year are obsolete—I should probably add links in them to newer posts, especially the 2011 AP exam score distribution and West Point Bridge Designer posts. The instrumentation amp lab post is a strange one of the 202 posts on the Applied Circuits course to be the most popular—this is probably Google’s fault. I should probably thank Google for keeping old posts alive—57,090 views or about 51% of my total came from search engines, and 54,104 or 48% of my views were referrals by Google. Bing contributed only 1,120, Yahoo only 1,413, and all other search engine referrals were under 100 each. Social media contributed more than I expected, since I don’t use Twitter or Facebook. Twitter referrals were 574, Facebook 470. Email lists probably contributed more, but they are harder to count, as only yahoo mail referrals are counted (564, plus 198 from the groups.yahoo.com/group/hs2coll/ homeschool to college list). I wonder why WordPress.com doesn’t count gmail referrals—I’m sure that gmail tracks the links. My being part of the Santa Cruz Sentinel Media Lab helped a little (405 referrals). One piece of advice I’ve heard for maximizing readership is to focus narrowly on one niche, so that everyone who comes to the blog knows what to expect after seeing one or two posts. That works for some bloggers, but I have eclectic interests and can’t really limit myself in that way—I don’t want to start dozens of blogs on different topics. So for the next year, I’ll continue posting whatever I feel like writing about. I expect that there will be a number of posts about my new freshman design seminar, because new courses always occupy a lot of my mental space. Home school and college application stuff will probably disappear after this spring, as my son will be graduating from high school in June. I may revive one of my old hobbies over the summer, in which case I’ll blog about it. The question is—what old hobby should I bring back, or what new one should I pick up? Probably it should either involve exercise (which I need more of) or making something (I feel attached to the Maker movement, but I’ve not really made much beyond stuff for the Applied Circuits or freshman design courses in the past year). My son finished the MIT application today—I’ll have to send out the transcript, the school profile, and the counselor’s report tomorrow. Recommendation letters and school reports can’t be provided online (except through Naviance, which home schools have no access to), but only via fax or hard copy mail. I’ll probably have to go to the Post Office tomorrow, as I don’t think we have enough stamps in the house to mail the transcript. I’m a little surprised that an tech school like MIT would be willing to have such a clunky piece of old technology as the main view that 18,000 prospective students see of MIT each year. It isn’t as buggy as the Common App, but it has a distinct early 1990s feel to it. The MIT application is obviously an old piece of legacy code (unless it is deliberately retro)—it doesn’t understand unicode characters (like smart quotes or em-dashes), can’t handle italic, and the PDF preview is rendered in the ugliest monospace font that is available (probably Courier). Update 2013 Dec 31: School documents taken to Post Office this morning, so MIT application now done. 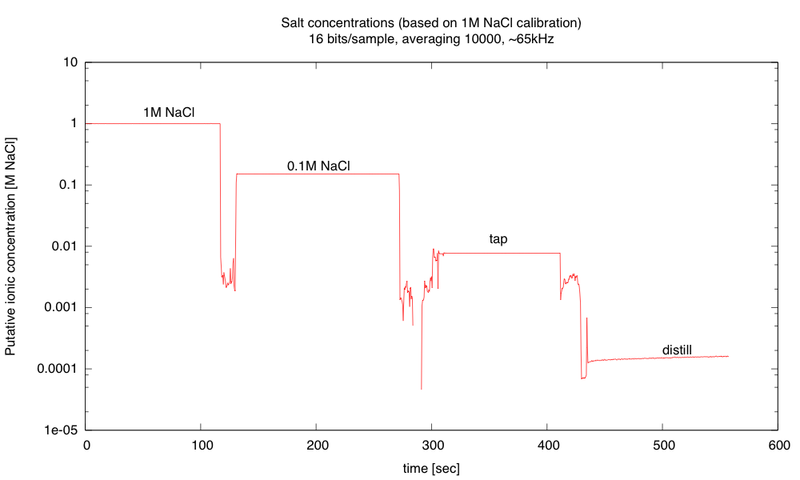 I was curious what the range of voltage measurements would be for different salt concentrations, and how linear the measurements would be. Measurements were made with a modified program, so that I could measure the applied voltage at the drive electrode as well as the voltage at the sense electrode. Conductance was computed as 0.01S * V_resist / (V_applied – V_resist). The first version of the program seemed to have some problems with fluctuation in the period of the square wave, probably from using the same pin for both digital out and analog in. I hooked up another pin to monitor the digital output and got a more consistent 65kHz square wave. The small differences are probably from cross contamination as I moved the electrodes from one bath to another. I wiped them between measurements, but did not get them completely clean and dry. The 0.1M and 1.0M solutions do not show a ten-fold ratio of conductances, only about 6–6.6 depending which set of measurements one takes. Either I did the dilution to make the 0.1M solution wrong (quite possible—I’m clumsy at even trivial wet-lab stuff) or my assumption that conductance should be linear with concentration is way off. It looks like the device should be able to measure from about 1E-4M to 3M NaCl. There is enough resolution in the ADC measurements to go down to 1E-5M (if the electrodes could avoid contaminating that) and up to saturated salt (about 6.2M). It would be important to have a series of test solutions to calibrate the unit, if the linearity assumption is wrong. Here is the source code for the KL25Z (using the mbed.org compiler). Pins A0 and A2 were connected to the drive electrode, pin A1 to the sense electrode. The sense electrode electrode was connected via 200Ω resistors to Gnd and 3.3V. For several years there have been Dance your PhD competitions, where PhD students try to embody their theses in choreographed dances. Some of these are amusing, some are elegant, many are painful to watch. I’ve never been the least bit tempted to join in the “fun” though, as dance has never struck me a particularly good way to communicate ideas, and producing a watchable dance video is a tremendous amount of work. Better than Dance your PhD are the one-sentence thesis summaries at http://lolmythesis.com. Here, hundreds of people have summarized their theses in tweet-size summaries. Doing VLSI layout the wrong way, by writing programs. Special bonus: an NP-completeness proof entirely in pictures! I haven’t decided whether to submit that or to wait for better inspiration. 2. What concept in your anticipated major were you most proud of mastering? 3. Briefly describe the course(s) you have taken relating to your chosen field. He now has three days to do three applications (MIT, CMU, Olin), and two more days for one more application (Caltech has a Jan 3rd deadline). Most of Monday, Thursday, and Friday will be taken up with the 3-day workshop with Ailin Conant of Theatre Temóin that WEST is doing on Dec 30, Jan 2, and Jan 3, so he really has only four full days for the four applications. I doubt that he can get all four applications done in time, but I’ll be satisfied if he gets MIT done—any beyond that are lagniappe. We did notice one more problem with Common App today—if you use their “I” button to italicize anything, it does a terrible job, changing the font size and family, not just putting the text in italics.